I’ve always thought that John Adams knew the enduring value of a good museum trip, and the power of art to sharpen the mind while refreshing a work-weary soul. How else would he have known to share this insight with wife Abigail, written at just about this time in another May spring, that of 1780: “I must study Politicks and War that my sons may have liberty to study Mathematicks and Philosophy. My sons ought to study Mathematicks and Philosophy, Geography, natural History, Naval Architecture, navigation, Commerce and Agriculture, in order to give their Children a right to study Painting, Poetry, Musick, Architecture, Statuary, Tapestry and Porcelaine.” With those words in mind, here’s a quick survey of early American art currently on special exhibit throughout the country. Please share more links in the comments. Offering “significant new readings of many familiar masterworks—some sixty paintings and eighteen photographs created between 1852 and 1877” that examine the Civil War and its aftermath, the Metropolitan Museum of Art’s “Civil War and American Art” is on view 27 May-2 Sept.
Local wonders can make epic landscapes. See early views of north New Hampshire as glimpsed through “Art of the White Mountains,” open at the Museum of Fine Arts Boston through 7 July. Check out the Art of the Americas Wing, too. The evocative Native American portraits of Pennsylvania-born artist George Catlin (1796-1872), completed during five trips to the West, are traveling outside of America for the first time since the 1840s. Take a closer look when you visit London’s National Portrait Gallery, now through 23 June. Modern art meccas can remind early Americanists that the questions we raise daily in the classroom or in conversation–identity, nationhood, and the power of culture in shaping policy—recur powerfully throughout other decades. At the Whitney, you can still catch “…As Apple Pie,” an installation examining how artists use a range of icons to convey “Americanness,” open until 9 June. At MOMA, “Performing Histories (1)” looks at art and revolution, including work on how 19th century philanthropists fashioned the “modern” museum. 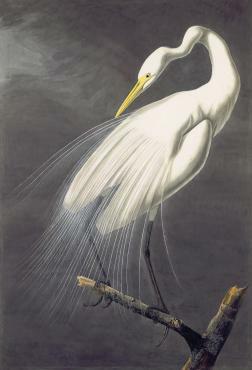 This spring, New-York Historical Society takes flight for a multi-year, rotating exhibit of the watercolors John James Audubon prepared for his epic Birds of America (1827-1838). Part I of “Audubon’s Aviary: The Complete Flock” runs to 19 May, with details here on what comes next. There’s plenty of riches to see at the Smithsonian, so here are a few new highlights: “Pictures in the Parlor” (to 30 June) reveals how the practice of photography changed the American home. Curious about how nineteenth-century creators appealed for patents? Look in on “Inventing a Better Mousetrap: Patent Models from the Rothschild Collection” before it closes on 3 Nov. Artist, abolitionist, spiritualist, entrepreneur: meet William Matthew Prior (1806-1873) at the American Folk Art Museum (until 26 May). Curators at the California Historical Society are taking a new approach to crowdsource a new environmental history for “Curating the Bay,” by presenting artifacts and “welcoming the public into this rich collection of materials to contribute their own stories, knowledge, photographs, and other sources to create a richer, more diverse history of the San Francisco Bay. The exhibition takes risks by asking visitors to fill in the blanks rather than presenting them with a finished narrative.” For more on the project and the Stanford/Historypin partners supporting it, go here. For related scholarship, see the College Art Association or check out the National Gallery of Art’s many helpful links on early American art here. Readers interested in how and why early Americans collected art may also want to check out the summary of the Smithsonian’s American Art Association records, 1853-1924, here. Enjoy!